Meria is available for one on one consultations/classes via the telephone, Skype,Facetime or in person. Would you enjoy speaking with Meria? You can discuss anything going on in your life, the world or beyond. Meria mixes her intuition, business experience and life experience to be the best “intuitive” coach you can possibly find. Meria considers herself a TEACHER first and foremost. She has taught Native American spirituality for close to 35 years now and is the Founder of the Universal Medicine Wheel. 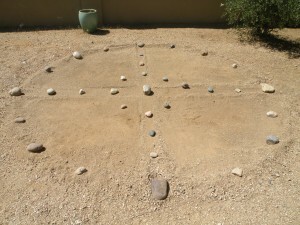 She has taught metaphysics in New York, Arizona and Europe too. Meria has been doing “readings” professionally since 1985. Meria is also a Usui Reiki Master. Meria uses her intuitive gifts daily to decipher the truth about what’s going on in the world, which she presents here on The Meria Heller Show and has since July of 2000. This is how it works: By arranging a consultation with Meria by going to Pay Pal and making payment to her account: Meria@Meria.net you are agreeing to open your Akashic Records to Meria. (subscribers to the Meria Heller Show get $50. off either the 1/2 hr or 15 min session). Subscribers need to make their discounted payment as a DONATION. That means she can look into your own projected life path before you came into body for this time and space in your life and give you the direction/coaching to achieve what you came here to do. Meria can always warn you of anything you need to avoid. Health problems are also discussed. Meria uses her years of knowledge to help every individual realize their full potential and live the life they intended! Once Meria is notified of your payment she will contact you via email to set an appointment. ***If you don’t hear from Meria within two days to set your appt, email her with your phone # or call 760-472-3620. Some emails are getting lost in the ethers or NSA’s files.If you’re with AOL they block Meria, so definitely send your phone number. Your payment reserves the time and spot for you. All you’d need do is decide how much time you want with Meria, and make payment. Book the Session of Your Choice Now! human being will never understand how blessed they are to have you in this matrix. I don’t understand how someone as pure and beautiful as you could have every come to realm to try and help those in oh so much need. Your amazing you are a light worker a true blessing from source the God in you shines so bright It lights up this prison. I know your getting older in age and I’m so jealous because your getting your boarding ticket out of here oh so soon. I am only 22 so I have only a small amount more of “time” here than you but it’s so amazing you are almost to the end of this journey. I love you and love the God that roars inside of you from the bottom of my soul. You mentioned during last phone session that I should ask my hypnotist to take me back when I was 8 years old and even that had to do with water. Well it worked!!! There were a lot of blocks that originated in that event, when I was drowning, there were a lot of things about low self esteem etc. Going to that event allowed me to get to the core of the problem, whereas without going directly to that age I don’t think I would have been able to solve that as quickly in hypnosis. -E.
Remember you are not alone and you are here for a GOOD time, not a long time. If that’s not the case, set up an appointment and get started on the most exciting part of your life! 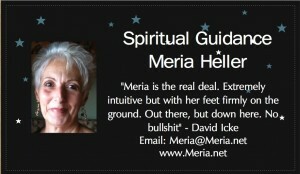 How to Spot Psychic Frauds from Meria Heller on Vimeo. 760-472-3620 to leave a message. Subscribers to the Meria Heller show get $50 off either the 15 min. or 30 min. read with Meria as a thank you!